How do group interviews work? They generally involve getting together with other job candidates to meet with one or more interviewers. An increasing number of companies use this type of interview to screen out unsuitable job applicants and it is important to know what to expect. Usually this interview involves a number of interviewers - potential managers or supervisors, human resources, even future co-workers - and a group of candidates all together in one room. This type of interview can take a number of different forms. What is a group interview? In its most basic form the group interview consists of a presentation, by the employer, to the candidates about the company and position. Generally there will be a question and answer session after the presentation. These simple interviews serve two purposes. Information is given to all the candidates in an economical and time-saving manner. It also gives the interviewers an opportunity to conduct an initial screening of the candidates as they observe the candidates' behavior and interaction with each other, their communication skills and the impression they make. Group interviews can be more involved than just a presentation. Candidates may be required to participate in work-simulation exercises and activities. These can take the form of group problem-solving sessions where each candidate's contribution and participation is noted. Discussion groups take a similar form. Other activities include splitting the candidates into teams where each team is given a work-related task to complete. Each team then presents their results to the whole group. What are employers looking for in candidates? The skills and behaviors observed include communication and interpersonal ability, persuasiveness and the ability to influence others, leadership and delegation, organizational and planning skills and the ability to work and contribute as a team member. Other observable behaviors include the ability to handle stress, to deal with feedback and give feedback and to analyze and problem-solve. Levels of individual knowledge are also noted. Sometimes the situational exercise is not work related. Candidates are given a controversial hypothetical situation, such as deciding how to choose who to save from a sinking boat. These type of exercises cause a lot of discussion and argument and interviewers will observe how people interact, influence and reach decisions. Before you begin the interview introduce yourself politely to the other candidates. You will be observed from the word go. It is important to be seen as an active participant rather than merely an observer. Contribute your views and ideas while also listening to the other candidates. Appear confident but avoid coming across as aggressive. Avoid dominating the conversation and don't interrupt the other candidates. Make sure that you take criticism and give feedback constructively. Give praise when possible and acknowledge valuable contributions from other candidates. Avoid obvious power conflicts as these will make you appear uncooperative and unprofessional. Stay calm under pressure. With many candidates all trying to contribute, someone may make your point first. If this happens, think of a statement that adds to this point. This demonstrates that you listen actively and think on your feet. Do background research on the company before your interview. Find out how to conduct meaningful interview preparation and stand out as a well-informed and prepared job candidate. Send interview thank you letters to each interviewer as soon as possible afterwards. Follow this advice and your job interview experience will be a positive one. You will stand out as a mature, confident and competent candidate. 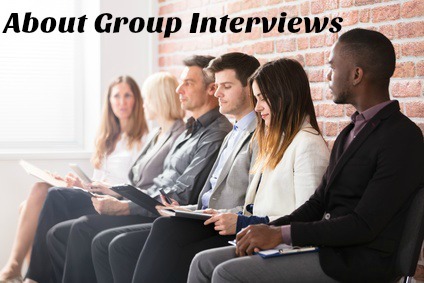 Be ready for the group interview questions you will face in this type of interview. View these expert group interview tips and techniques and make the right impression in your interview. Know what to expect in a panel interview and be prepared for this type of job interview. Learn panel interview tips and techniques to help you impress the interviewers. 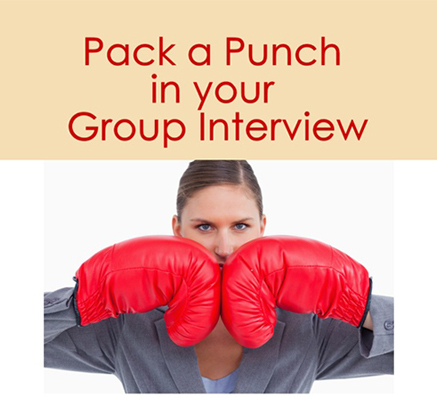 Be confident that you are well-prepared for your group interview. Use the pre-interview checklist before your interview.